Say what now? AMARULA carrot cake? No, your eyes are not deceiving you; we really did take a perfectly delicious carrot cake and made it a gazillion times more yummy by adding booze. It’s the South African way. So here we are, ladies and gentleman, feast your eyes, alert your taste buds and let’s get baking. Start, as usual, by preheating – you want it set to 180°C, while you butter and flour both of your cake pans. The best size is a 15cm (in diameter) pan with a 7cm side. Once buttered and floured, line the pan bottoms with parchment paper. Hopefully you have your cake ingredients together, so start by adding all of the dry ingredients (except the sugar) into a bowl and mixing it through. Now, using an electric mixer, beat the eggs, sugar and oil together in a large bowl. You want this to be a smooth and thick paste – it should take around 3 minutes of beating. Once ready, add the Amarula at a reduced speed, before adding the dry ingredients to the mix. This should be done very slowly until it’s well mixed. 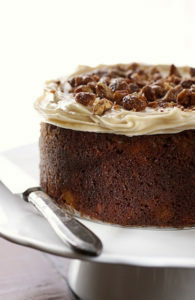 Turn the mixer off and add your grated carrots, pineapple, apricot jam and pecans and mix well with a rubber spatula. Divide the batter into your prepared pans and cake for around 1 hour. TIP: Your tester should come out clean. Cool the cakes for around 10 minutes, before cutting around the pan sides and turning the cakes out onto the racks. Peel the parchment off and cool completely. While the cakes are cooling, take the opportunity to prepare your frosting. Beat the cream cheese and butter with your electic mixer – it should be smooth and fluffy. When ready, beat in the powdered sugar and then the Amarula. Once the cakes are cooled, spread a thick layer of frosting over both cakes and stack the one on the other. Decorate with your chopped pecans and serve.